Software Defined Networks and Network Function Virtualization will create more stable and responsive architectures. But how do you monitize it? Software Defined Networks (SDN) and Network Function Virtualization (NFV) enable cloud service providers (CSPs) to build more agile and flexible communication infrastructures. According to Gartner's research director Martina Kurth, this technological innovation gives CSPs the power to create and deliver cloud-based services for enterprises or organizations in the way they need them. Hence, CSPs should be better empowered to challenge service models adopted by top cloud service providers like Amazon and Microsoft. So far, SDN/NFV has been deployed for trial use or in few fields on a limited scale. Today, the fierce competition forces CSPs to put SDN/NFV into operation as soon as possible to generate revenue. Kurth said, "At first, we've been focusing on the technical challenges of SDN and NFV. Now, the paramount concerns are shifted to commercial application and opportunities of generating new revenues." Which new virtualization services will upend the market to the maximum extent and help us take the lead in the market? Which areas should we invest in? How is the revenue potential? How long does it take to generate new revenues? 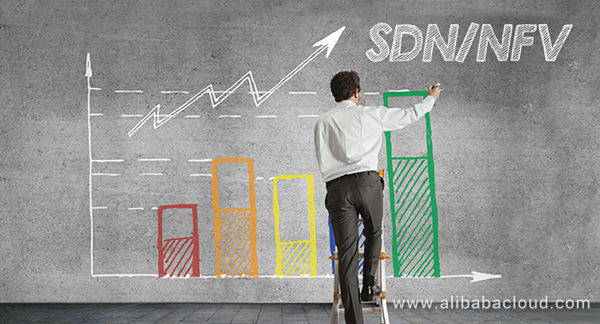 What are the new services and revenue sources that SDN/NFV can bring? How long does it take to show the benefits? The following figure shows the impact of key technologies on the expected time for benefits. Services like the virtual Customer Premise Equipment (CPE) have great potential in generating revenues and can get quickly deployed. Regarding the SDN/NFV's rate of return on investment, it is easy for those services that help improve service agility, operation efficiency, and service modeling capabilities to show effects, for example, on-demand virtual security and unified communication services. Other IoT services also have great potential in generating revenues in the long run, except that it takes a longer time to gain benefits. How Can CSPs Commercialize Deployed SDN/NFV in a Wider Enterprise Scale? Learn the go-to-market impacts of SDN/NFV from the business point of view. SDN/NFV enables CSPs to fully utilize the digital value chain and work with the third-party ecological system players to build new business patterns. However, this objective can be hardly achievable without operation strategies, revenue planning, and go-to-market planning. Expand the coverage in different regions, and then quickly and efficiently deploy SDN/NFV in a large scale. Starting from a small scale, apply accumulated experiences to broader operation scenarios, fields, and entities. Do not ignore investments in the customer-oriented digital IT, which helps the new business patterns, such as IoT or network slicing, generate revenues. Focus on several critical operation best practices and agile tools to accelerate deployment of SDN/NFV. Pay close attention to the operation of SDN/NFV, and gradually increase investments in the new SDN/NFV orchestration architectures. In addition, pay attention to the operation tools (such as prediction and analysis, service modeling, and artificial intelligence), as well as standards and templates that help standardization of SDN/NFV. Implement organizational reform and leader management at the early stage. Develop a complete set of organization and talent audit mechanisms, fully utilize your investments in SDN/NFV, and introduce a set of agile service creation and test processes similar to DevOps based on the architectures, development, and operation of the network and IT. In this article, we discussed the commercialized deployment of SDN/NFV by CSPs and how it can add value to their business. At present, not many fields have explored SDN/NFV, and that, too, to a very limited extent. However, due to intense competition, it has become a necessity for the CSPs to adopt this technology as soon as possible. We also talked about the strategic planning and actions that are required to go ahead with the process successfully and achieve maximum ROI. New to Alibaba Cloud? Sign up for an account and get up to $1200 to try over 40 products and services. Or visit Getting Started with Alibaba Cloud to learn more.